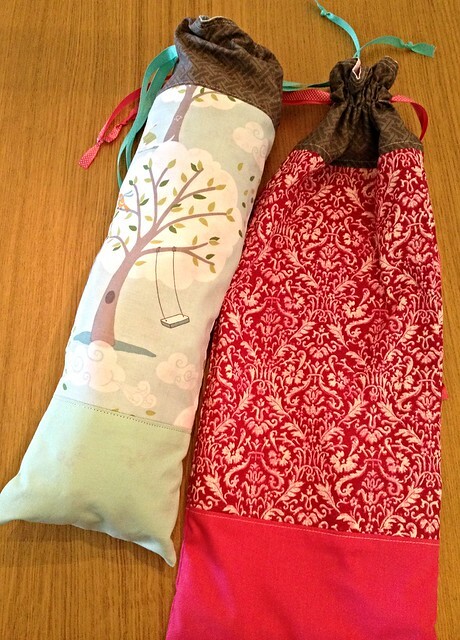 Tutorial: Plastic Bag Holder…or…Bottle Gift Bag! For a while now we have been making our plastic bags into little balls and putting them in the cupboard under the kitchen sink. Well, I didn’t actually realise how out of hand the collection was getting until they started spilling out of the cupboard…I’m sure we had over 100 bags under there! This spurred me on to make a bag to hold a few plastic bags AND to get rid of the others! I had an idea of what I wanted to make in my mind but I couldn’t find any tutorials online to match so I decided to draft what I needed myself. The bag I had in mind was close to the ones from Jeni’s tutorial over on In Color Order. Only, I wanted an accent piece on the base as well as around the top. As I wanted a long narrow bag, I also needed to change the measurements. 5 Comments Tutorial: Plastic Bag Holder…or…Bottle Gift Bag! When I started sewing more regularly (last August!) my Mum mentioned that she would like a knitting needle case as she couldn’t find one that matched the style she wanted. My original thought was to make one for Christmas but I forgot and then by the time I remembered, I hadn’t got enough time. So I set out to make one in July for her birthday – August 6th. I had a good look around online to get some ideas for the one I wanted to make. I wanted the make to be ‘fairly’ simple but also pretty and useful. 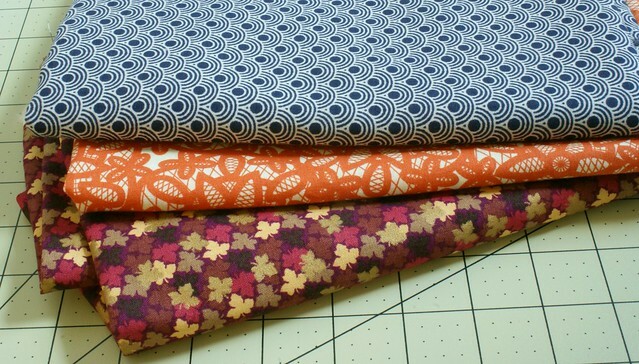 By combining a few ideas, I chose to make a roll with three horizontal sections for different sized needles. 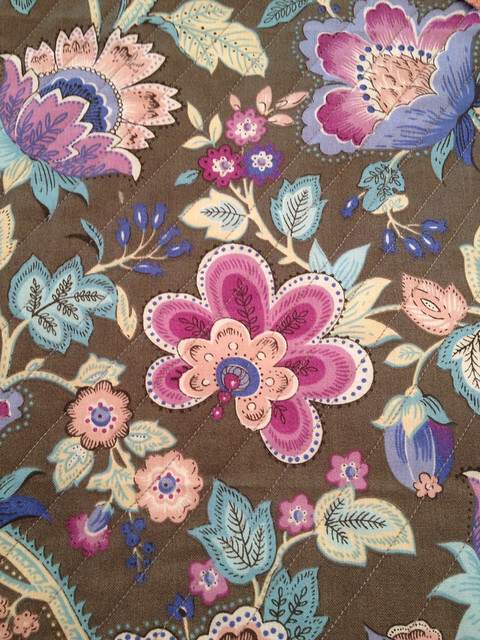 I also want to add a bit of extra detail so I decided to quilt the outer piece of fabric. I’ve just realised that I have been a little quiet on the blog over the last week or so. I’ve actually been overwhelmed with projects, and I have been quite busy trying to get things finished. A few weeks ago I borrowed Lola Nova’s book from the library. This isn’t a sponsored post…I’ve included a link for if anyone wants to look at it! It has some great projects in it and has a bit of a bohemian feel to it. Lovely photography and fabrics. 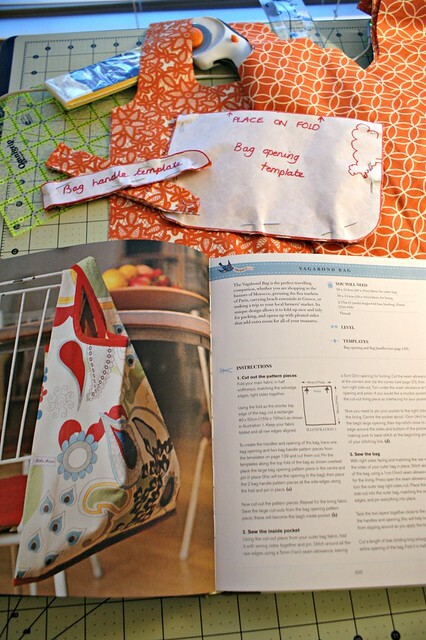 I used one of the projects in the book as inspiration for my patchwork bathmat. There was also a couple of bag projects that I wanted to have a go at. I needed a bag to take to the library, to hold any books or DVD’s that we are checking out or returning. At the moment, I am using a foldaway bag from H&M. The pouch for the bag is quite modern and has a geometric print on it. However, the actual bag is just a thin black polyester. Adam says that it is ugly and he sighs every time I use it! The Vagabond bag in the Lola Nova book seems like a perfect bag for library visits. The only thing that put me off was the bias binding; I declared my hate for it here, but I was prepared to give it another go. With all the beach trips we have been on and the many we have planned, I am always finding myself wanting to take a crafty project with me. Most recently it has been crochet, but I have also had some hand sewing that would have been nice to complete on the beach with the waves crashing in front of me! I needed a little bag where I could keep crafty bits separate to sun cream, drinks and towels to avoid any damage. I came across a pin from Lori over at A Bee in my Bonnet. Right at the top of her post is a row of these adorable little drawstring bags! Cute and just perfect for the bag I had in mind; somewhere to put a few little bits, easy to access and covers the contents up from any sand that may be blowing my way. I headed over to Ayumi at Pink Penguin for the tutorial. 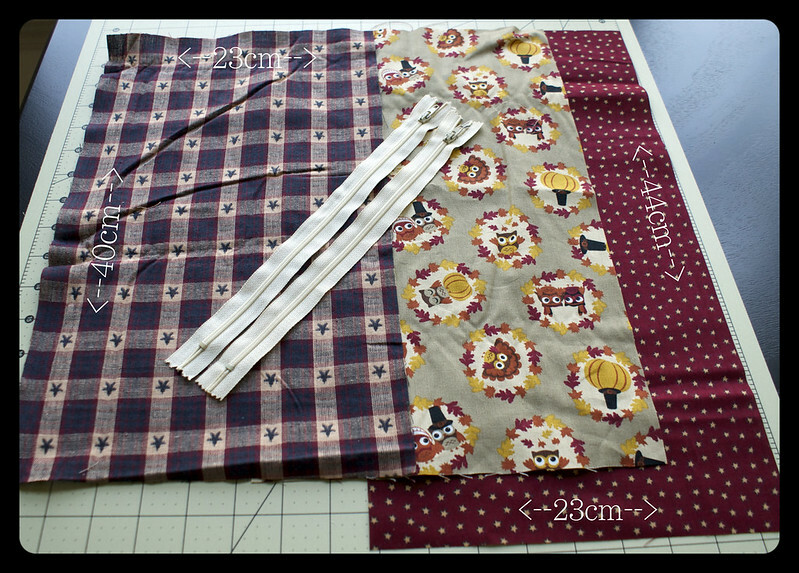 Ayumi suggests using oilcloth for the bag, which would be perfect if I had some…but I didn’t and I wanted to try and use some of the fabric that I already have. I chose 3 fabrics to use, making the handles the same as the main body fabric, and I made the rim the same as the lining. 16 Comments Cute Bag Pattern Alert! One of the main problems that I have found with living in a one bed apartment, is that it is so difficult to keep tidy. I like to think of myself as an organised person anyway but anything that is left out looks messy 😦 Adam has placed his guitar and amp in the living room/open plan living area. Accompanying his guitar are pics, tuners, leads and other things that I have no clue about! Along came the double zippered pouch. Two compartments; one for the leads and the other for the other bits! This also counts as one of my Sew Selfless September items as it is a gift for Adam 🙂 … and it will keep things tidy! I found this tutorial on Pinterest which seemed to be easy to follow. There was a video and a series of pictures to flick through! They were easy to follow and well labelled. I made my pouch bigger than the one on the tutorial because I needed to fit a larger lead in.